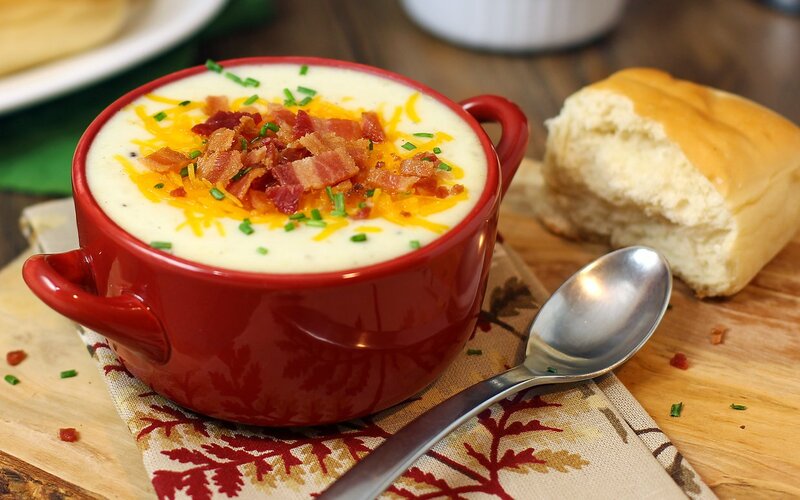 Here’s a simple potato soup recipe that’s loaded with goodies! Poke potatoes (either fork or knife) and microwave on high for 13 minutes or when you find tender. Cut in quarters and let cool a bit. While the potatoes are cooking fry up the bacon. I prefer crisp and break into pieces. Heat the olive oil in a pan over medium-high heat and sauté the onion for 3 minutes. Add the chicken broth, flour, 1/2 cup milk. Bring to a boil and cook for 1 minute stirring often. Remove from heat and add salt, pepper, bacon pieces and sour cream. Remove potato skins, slice into additional smaller chunks and stir/mash into the soup. Top soup with cheese and green onion. This is quite a yummy recipe and has won over guests every time I’ve served it. I also like to serve fresh warm bread such as the type you can pick up at your local Panera or bakery. Please let us know what your experience is and any modifications you make.